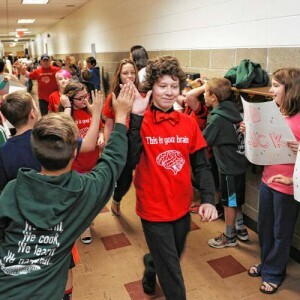 GILL — Students from Gill Elementary School lined the hallways with posters and cheers on Monday morning to send the school’s Destination Imagination team off to global finals. Principal Conor Driscoll said the send-off started with the six sixth-graders from the team running through a banner and going down the hall into the all-purpose room at the school. Driscoll and the team’s adviser, sixth-grade teacher Dave Grout, spoke to the students before the send-off, a reminder to the team and others as to what a big deal qualifying for this event was. Driscoll added that the school has never had a team like this one qualify for a national or global competition. He said celebrating something like this is just as important for the community as the students. “We make a huge deal of sports, but when you think about the role of schools in education, to have something like this be a big deal is really amazing,” he said. Driscoll said the achievement speaks to the education they’ve had throughout their years at Gill Elementary.